I “like” how I really didn’t think this video could get any more terrifying than the singing tracheotomy, but then it decides to become some sort of acid-fueled PSTD flashback to that one time I watched “Eel Girl,” and if you’ve ever had the misfortunate of seeing “Eel Girl,” you know exactly the sort of nightmare that can’t ever be unseen that video is, which is precisely why this video is not okay in the slightest. 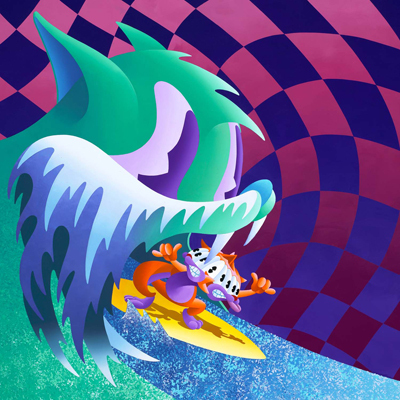 So congratulations (woof again), MGMT. “Flash Delirium” has just beaten out the Bravery’s “Hatefuck” as the most totally batshit crazy nightmare machine music video I’ve ever seen. Congratulations sounds like it could be a winner, but I can’t hear anything over my bleeding eyes. Much love to Vulture for the video. This entry was posted on Tuesday, March 30th, 2010 at 12:56 pm and is filed under Music and Music Videos. Tagged: Batshit Crazy, Congratulations, David Cronenberg, Eel Girl, Flash Delirium, Indie Rock, MGMT, Nightmares, Puppets, The Royal Tenenbaums. You can feed this entry. You can leave a response, or trackback from your own site. Listen to “Brian Eno” off the album, it will make you feel better. Or less freaked out. Strangely enough, I’m going off “Flash Delirium” as reason enough to warrant buy Congratulations, so I’m trying to hold off on listening to the rest of the album ’til it’s official release. That said, I gave “Brian Eno” a spin, and holy Moses is it a delight.